Metano IBC Services carries and distributes spill and secondary containment basins across the world, compatible with any IBC type or design. 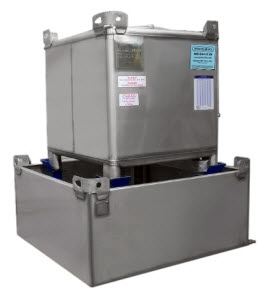 These secondary containment basins are equipped for all industries including petrochemical, food and beverage, as well as industrial and chemical storage applications. By design, IBC containment basins capture spills, leaks, and more to allow for an easier clean-up. Metano’s containment basins are available in carbon steel or stainless steel variations, featuring a 2” half coupling with plug to allow for drainage. Spill containment basins by Metano IBC Services also feature a top rim reinforced with a 2” inward flange. Our stainless steel containment basins are corrosion, chemical and rust resistant while all of our products are anti-flammable by design. Contact Metano IBC Services today for a containment basin designed to fit your space and tank requirements.